Time for another Empress show! Seems like I always end up at the Empress, doesn't it? I have to tell you, I love the tight-knit community feel of the place. Every time I go, I am surprisingly greeted by name and escorted to my seat - after only having done one show there two years ago. Oh that all theaters gave such VIP treatment. I also always end up having friends in their productions and you all know how I mostly go see shows to support my amazingly talented comrades. Enter Kristen Fox. She's the most spitfire character at The Spitfire Grill. But back it up. You are probably wondering what this show is even about, right? I consider myself a Broadway aficionado and had never seen this one. 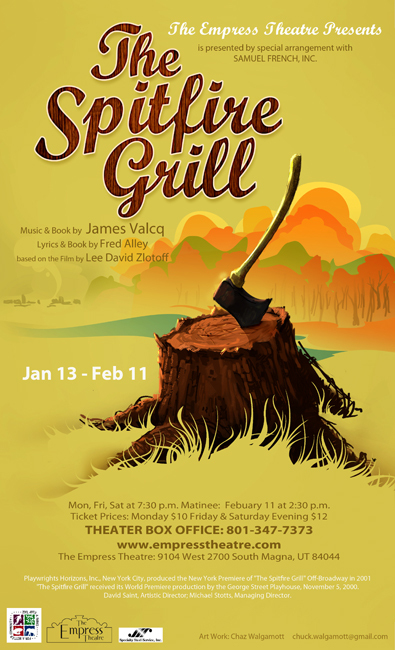 Basically, an ex-con starts life anew in the town of Gillead, which is so small there is only one place to eat - The Spitfire Grill. Eventually, the townsfolk decide to sell off the Grill to the winner of an essay contest with an entrance fee of $100. Not the most exciting plot or the most exciting music, but such a sweet, backwoods, folksy feel. Back to Kristen. And all the other actors and actresses. Of course, I love Kristen's character, Effy, because of the sassy, town-gossip, outspoken zaniness of her. My favorite scene was probably when she demanded to know some information, the other characters teased her, and she let out this high-pitched squeal/scream before stomping her foot and dramatically exiting the stage. Love. And can I tell you how much I adored the live accompaniment? Especially the fiddle? Hats off, Eric Barney. Wow. The entire show, he just kept playing and playing. Dare I say it, but I think that fiddle sets the atmosphere for the entire show over and over again. You know what else I loved? Every. Single. Person. There was not a weak link among them. Not a missed note. Not a squeak. Harmonies bound so tightly even Chuck Norris would be jealous. If there is anything you don't like about the show, it will not be the fault of these performers, trust me, but rather the fault of the actual, somewhat-slow script or the repetitive composition. I cannot say enough about the musical skills of these performers - they deserve to be seen. I cannot write this without giving huge accolades to Shawn Maxfield for blowing the roof off the place in a show-stopping ballad. I've seen him perform several times. Heck, I performed with him for over six weeks. And this performance is, in my opinion, the pinnacle of which I have seen him. W.O.W. One more mention - Brittany Boynton's change-of-heart ballad towards the show's end will also widen your eyes and have you thinking, "Daaaang. Girl can sing." You can catch the show at The Empress Theatre on Fridays, Saturdays, and Mondays now through February 11. The weather outside is frightful, but The Spitfire Grill's delightful - so as long as the winter snows, see a show, see a show, see a show (like this one)! Thank you for your kind words, your friendship, and your support. You are rad. Sorry you found the script somewhat slow and the composition repetitive. Among those who love the script and composition (and have told me so repeatedly) are Stephen Sondheim, Sheldon Harnick, and Hal Prince.